The Maxi-Cosi pushchair footmuff offers stylish and practical protection from cold weather. Made from deluxe weather-resistant fabrics, it keeps your baby or toddler cosy from head to toe. Designed for use with the five-point safety harness in your pushchair, it makes getting ready to go out on chilly days a dream. It’s suitable for use from birth and the zipped front is quick to undo to get your baby out. Crafted for a perfect fit, it’s compatible with Maxi-Cosi Stella, Maxi-Cosi Mura Plus, Maxi-Cosi Loola 3, and Maxi-Cosi Elea pushchairs. The Maxi-Cosi general footmuff has holes to line up with the harness straps on your pushchair. It’s easy to thread the harness through and easy to remove the footmuff for washing when you need to. There’s a neat, draw cord hood to create a cocoon to protect your baby from cold winds. As they grow, use the footmuff as a leg warmer up to the age of around three years old. 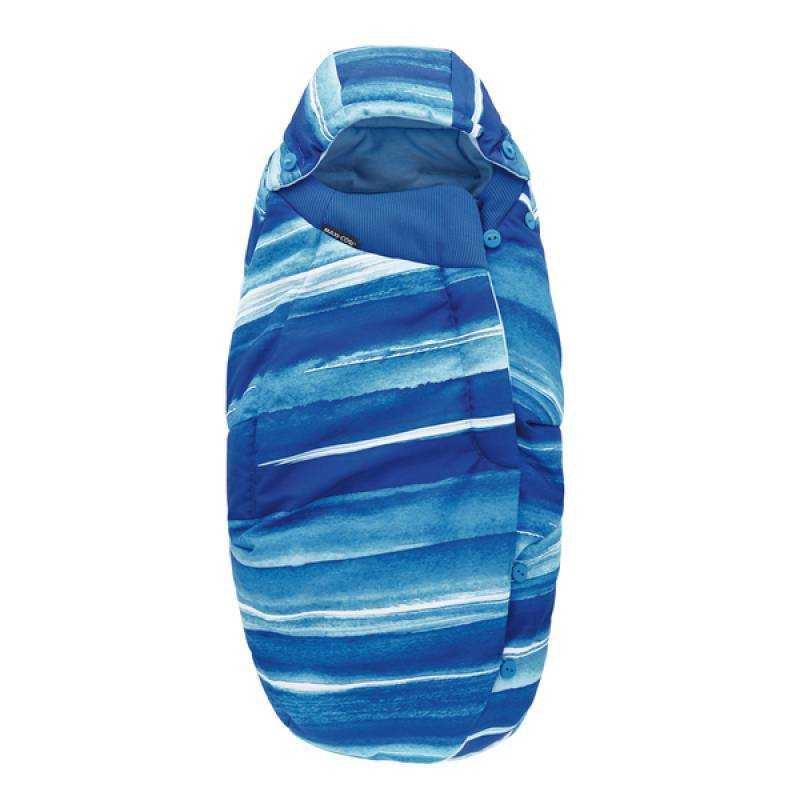 The zipped front also lets you use it as a pushchair liner on warmer days. Adding a cushioning layer, it offers extra comfort on long walks or for nap time. A warm fleece lining feels soft against your child, while the outer layer shields your child from the winter weather. Keeping your baby warm from top to bottom, it provides better protection than a winter coat. And it’s easier too as the harness does up inside the footmuff meaning no struggling with straps over bulky layers. When you reach your destination, simply unzip and your child is ready to go. It’s available in colours to co-ordinate stylishly with your pushchair, or choose a contrasting shade to match your mood. Part of our range of smart Maxi-Cosi pushchair accessories, look for umbrellas for shade from the sun.